NEW~ I first came across this product at the HIA show in Dallas in 2004. I took a class offered by Donna Kato, many may know her from her segments on Carol Duvall. As an artist, she developed this polyclay to better suit her art projects. I found it far superior over the other brands on the market, mainly because once baked, it remains flexible--no more broken edges on my projects and it is stronger. It also does not seem to be crumbly. Other features are the colors are stable and of uniform consistency; easy to condition; does not become sticky after continous kneading or rolling. She had many examples of mailable post cards made with this clay-yes, able to go thru the postal system without breaking. It is difficult to find, so now I am offering it to you to try. I think you will find it a wonderful medium to work with. Select your color from this chart. The colors are more vibrant in packages. Packages are 3oz~50% larger than the other brand at about the same price. Standard Polyclay Colors: yellow, orange, red, magenta, violet, ultra blue, turquoise, green, white, translucent, black, brown, beige flesh. All 3 oz. 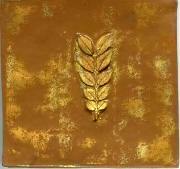 Metallic Polyclay Colors: Pearl, Silver, Gold & Copper. All 3 oz. Liquid PolyClay~ This helps you do more with your polymer clay. It works as an extender, softener, adhesive and a finish coat. You can do photo-transfers or complex grouting effects. You can mix it with paints, inks or dry pigments to make colorful glazes that bake and bond to polyclay. No picture, comes in a 2 fl. oz. bottle with tapered spout. Kato Blade Sampler~ Set of 3 polymer clay blades to meet all your cutting needs. Set includes T-blade, traditional blade for fine and detail cuts; NuBlade-minimal torque & twist for cutting larger & smaller canes & blocks and the NuFlex Blade - flexible blade for making curved cuts. Accordion style books made with polymer clay. 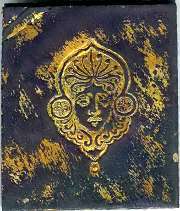 A sheet of gold leaf was applied prior to stamping with Articus Studio stamps and then strategically sanded off. Repel Gel~ Non-toxic & water soluble, this prevents polymer clay (any brand) from adhering to itself while curing. It can also be used as a mold release. Create braids, loops, purses, fringe, curled hair effects, photo frames, luggage tags and so on. I've added a visual below to make a usable luggage tag, apply Repel Gel to areas you don't want the clay to adhere to the clay on top of it, the center of the tag, you don't have to let it dry, apply pressure to areas you do want clay to bake together and bake the clay as normal. When finished baking you have a tag that opens in the center. I used it in making a hinged pendant and allows hinge to move freely. No picture, just in 3/4 fl. oz. (22ml) screw top jar.